Eldoret, Kenya. January 2012. This male has expanded the neck and upper chest as a display. 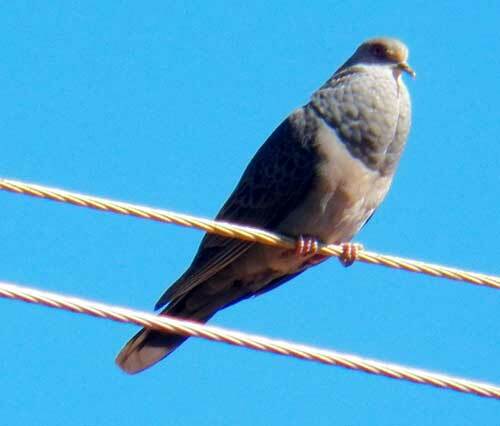 These doves are common in Kenya especially near water such as irrigation schemes and in agricultural areas generally. They feed especially on grass seeds and spilled grain on the ground. The eyes are yellowish and a patch of bare reddish skin around the eyes. The feet are also reddish. Mourning Collared Dove is related to the Eurasian Collared Dove which has been introduced to North America.